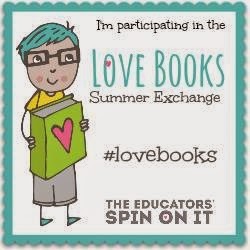 We are so lucky to participate in the Love Books Summer Exchange for the second time! It is graciously hosted by The Educators’ Spin On It. If you are not familiar with The Educators’ Spin On It, you are in for a treat. Two educators, Amanda and Kim, share wonderful tips they learned in their teaching careers with all of us! 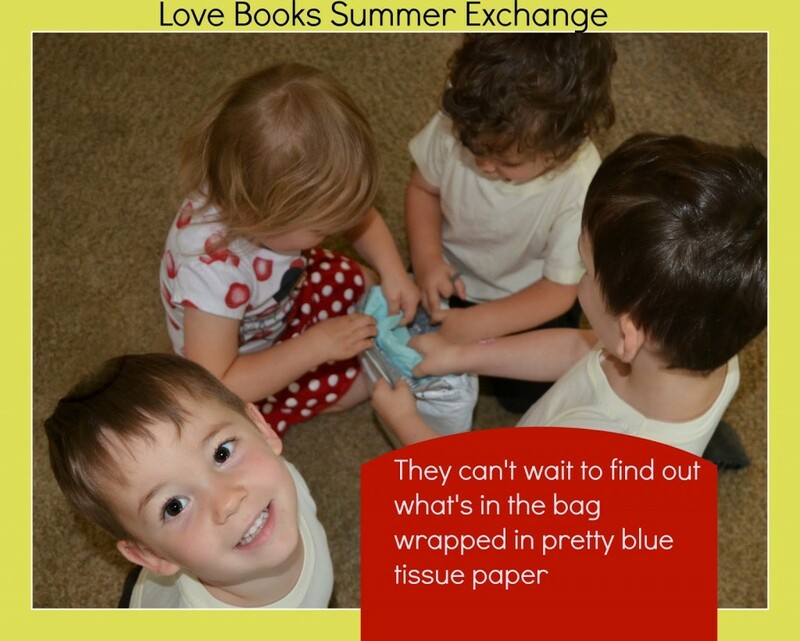 This is the third year they have organized the Love Books Summer Exchange. Last year, we enjoyed Goodnight California that we received from Growing Book by Book. This year, we were paired with Tara from Feels Like Home. The Sugar Snaps were so excited when the package from Tara’s family arrived in the mail. We also sent Tara’s family a package. Be on the lookout on Feels Like Home to find out what we sent them and what activities they did. The package contained all of these wonderful art supplies and the book Giggle, Giggle Quack by Doreen Cronin. 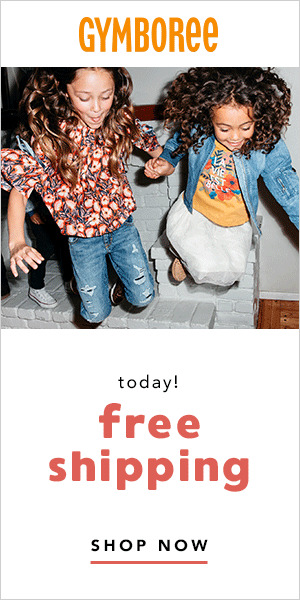 We were so excited. We had never read the book before and I proceeded to read it to them right away and they really enjoyed the humor. 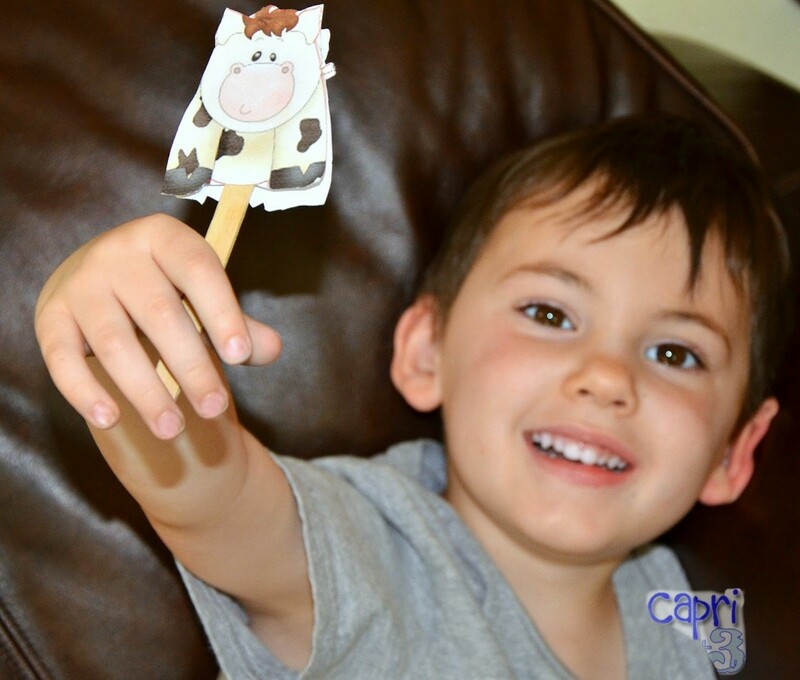 The story is about a farmer who leaves his brother in charge while he is on vacation. 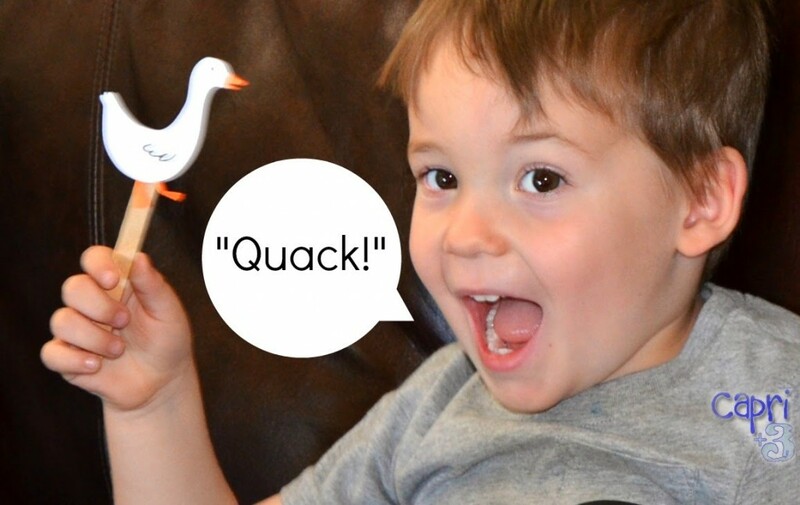 A mischievous duck changes all the notes he had written to his brother for instructions and the animals have all kinds of fun while Farmer Brown is away. 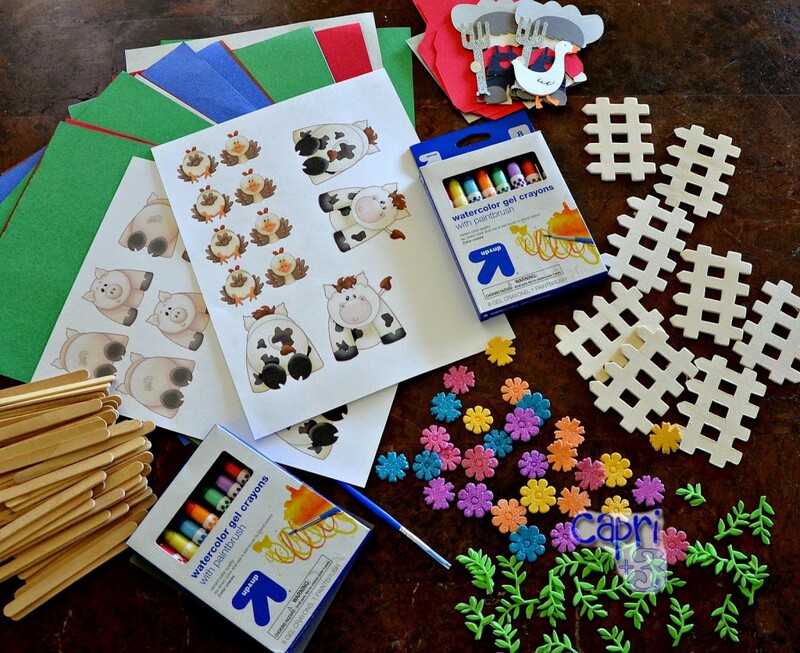 Tara provided the animals you see pictured above on heavy cardstock. 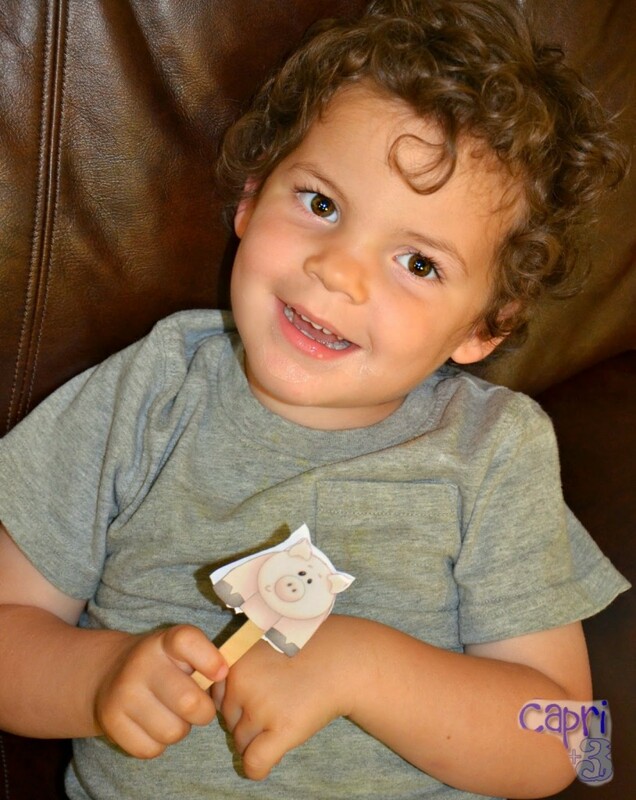 I cut them out and used the provided glue dots and popsicle sticks to make puppets to go along with the story. The Sugar Snaps started calling out which characters they wanted to play as soon as they spied the puppets. They all had fun using the puppets to act out the story. I love that there are so many characters to choose from and that they can take turns playing the different parts each time we read the story. Tara suggested we use the art supplies she sent to make background to act out the stories. 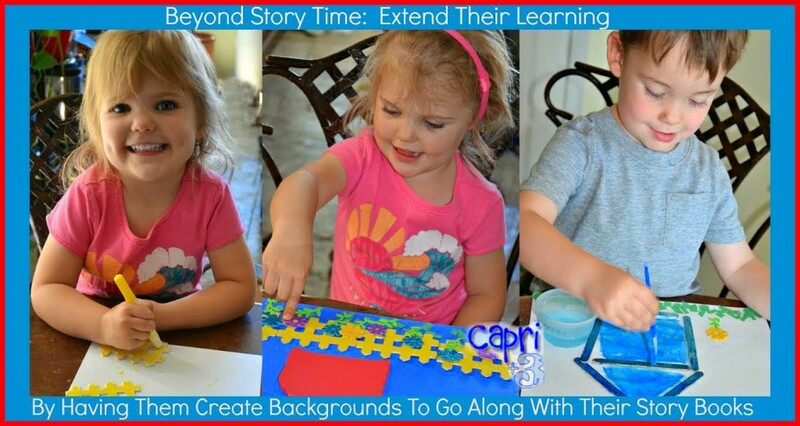 The Sugar Snaps had so much fun creating the backgrounds together. We had never tried water color pens before. I love that they can use them as pens and then blend them with a paintbrush and water. They practiced their scissor skills by cutting grass from green construction paper. We really appreciate the thought and effort that Tara and her family put forth to send us this fun package full of engaging activities! We will be enjoying Giggle, Giggle Quack for many years to come. If you haven’t had the pleasure of reading Feels Like Home, please head over and check it out. Tara has so many great ideas and helpful hints. She has even published a book on ingenious ways you can use things you already have at home! Book exchanges are so much fun! If you haven’t tried it, I suggest joining in or creating your own. Other families will come up with activities and books that are new to you and you will do the same for them. It adds a spark of excitement in early literacy that your children (and ours) will not soon forget. Their backgrounds are so pretty! I'm so glad you enjoyed your package! OH too much fun!! 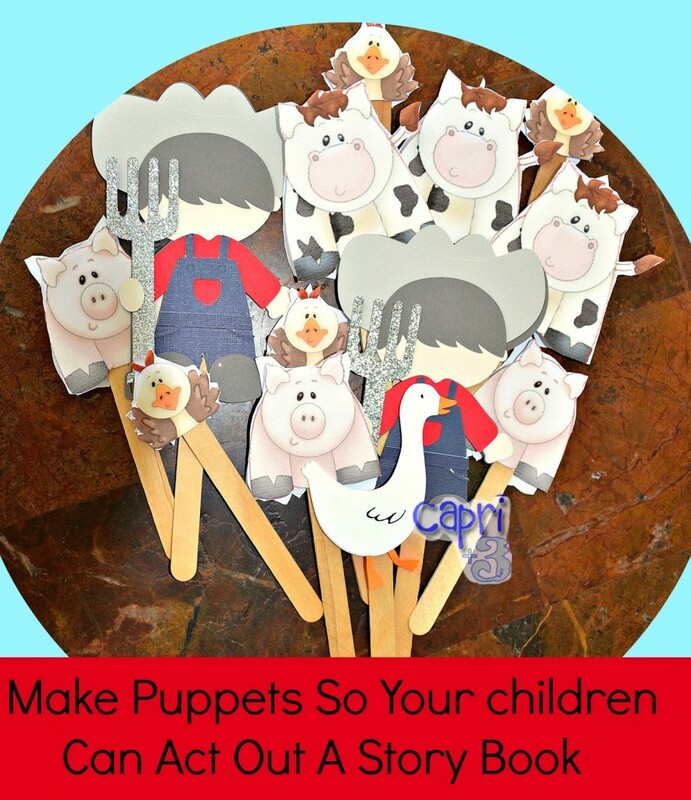 I want copies of those puppet printables. Thank you Tara, for such a fun package with such thoughtful detail. We really enjoyed it. The printables were a lot of fun. I am not sure where Tara found those. If you are interested, you may want to connect with her on her FB page and ask her. She is full of great resources! They did have a great time. We have continued to enjoy reading the book too. Perhaps you can be the first to start a book exchange in your area? I imagine lots of people would be interested. 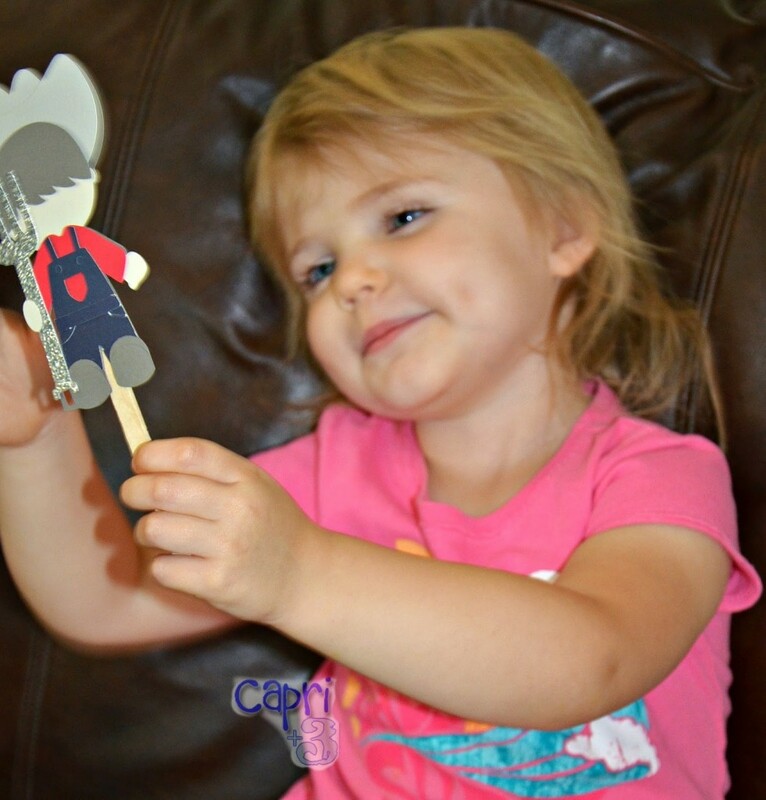 Those are awesome puppets – such a great literacy extension! Tara had great ideas and we had so much fun implementing them. Thank you for hosting this awesome exchange! It was a lot of fun. I love that the book exchange introduces us to other families and Mamas with ideas that are fun and new to try.